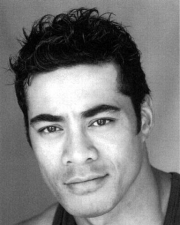 Robbie Magasiva is a Samoan New Zealand actor who has starred in several films and as a member of the Naked Samoans comedy troupe. He has also appeared on television and theatre, and was the co-presenter of New Zealand's Tagata Pasifika with famed athlete Beatrice Faumuina. Magasiva is also known for his role on Shortland Street as Dr. Maxwell Avia which he has played from June 2009 to present. Magasiva had his start on television during the 1990s, beginning with comedy. In 1999, he portrayed Mason Keeler in Jackson's Wharf. In 2001 he starred in his first major film, Stickmen, and joined the Naked Samoans. In 2002, he played Mauhur in Peter Jackson's The Lord of the Rings: The Two Towers. He returned to television in the show The Strip, continued his work with the Naked Samoans, and made a minor appearance in Power Rangers: Ninja Storm, also starring his brother Pua as the brother of Pua's Character of Shane Clarke. In 2006, Magasiva co-starred in Sione's Wedding, a comedy film that achieved commercial success in New Zealand. In 2007 he co-starred in the horror film The Tattooist. He has four brothers, Stevan, Miki, twins Pua and Tanu, and one sister Trina. Robbie has joined the cast of Shortland Street as Dr. Maxwell Avia. Whole or part of the information contained in this card come from the Wikipedia article "Robbie Magasiva", licensed under CC-BY-SA full list of contributors here.